In 2011, the Chargers had arguably their worst season under quarterback Philip Rivers. The once sure bet fantasy starter turned into a mediocre one last season. And while we can credit some of his efforts to injuries on the offensive side, many experts believe Philip Rivers struggles with accuracy and decision-making. The shining star for the Chargers last season was clearly running back Ryan Mathews. He had over 1,500 rushing and receiving yards, rushed for 6 scores and finished as the 9th best fantasy back. With Mike Tolbert out of the picture, Mathews is looking at becoming a fantasy stud this season. Robert Meachem. A lot of people have been leaning towards Malcom Floyd, but I’m very hesitant in doing so given Floyd’s history in the system. Let’s take a dive into Floyd’s numbers. Last season, he had 4 games with 5 or more receptions, and he caught just 2 balls in 5 of them. On the plus side, he only played 12 games, and his average yards per game totaled 71.3. Stretch that out over 16 games, and you’re talking an 1,100-plus yard season. The problem, however, is Floyd’s health. Since flirting and becoming the second wide receiver option in San Diego, Malcom has played no more than 12 games in a season. He’s had a hard time getting on the field throughout his career. A reason I like Meachem more is because of the uncertainty factor. He’s got the potential talent of a true number one wide out in the NFL. After all, in 2007, he was drafted in the first round of the NFL Draft by the Saints. And while he’s never been close to that number one role, Meachem is expected to be that guy for San Diego this year. When Vincent Jackson was in the top dog in San Diego, Rivers made him one of the best fantasy options at wide receiver. In all honesty, the Meachem pick is more of a gut feeling. I can’t really get into numbers with him because he was the third and fourth option when in New Orleans. But given that he’s being drafted just a round before Malcom Floyd in most drafts (Round 7 vs. Round 8), I think it’s worth the gamble. Keep an eye out on that battle up and through training camp, however, because just like anything else in the NFL, things can change quickly. He’s failed to stay healthy the last two seasons. His yards per game has steadily been decreasing. The tight end position, in fantasy football, is overrated. There are too many valuable players and positions being taken in the 5th round, where Antonio Gates is currently being drafted. That’s it. I wouldn’t get Gates. Philip Rivers. While he did finish his the 2011 year strong, he definitely has taken a step backwards from where he was just two seasons ago. Owners are getting Rivers three or four rounds before players like Ben Roethlisberger, Jay Cutler and Matt Schaub. Why? Last season, Rivers finished 9th among quarterbacks. This off-season, we saw him lose his favorite target. Now, Rivers is expected to finish around the same rank as Peyton and Eli Manning? If you’re choosing to get a quarterback late, why would you get a player who is more than likely going to finish, at best, as a middle of the road starter? As I mentioned, Rivers lost his favorite receiver, so we shouldn’t necessarily expect him to miraculously finish better than Matthew Stafford. If you look at someone like Jay Cutler, being drafted four rounds later, you see a guy with a world of potential in fantasy this season. He’s got his old buddy back, Brandon Marshall, and was actually putting up decent numbers last season before getting hurt. 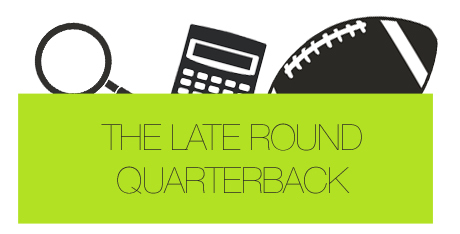 Go with a higher reward choice if you’re not getting an early round quarterback. You shouldn’t be getting an early round quarterback anyway if you’ve read my book or followed my blog. Similar. I think we can expect the same type of performance from each player as we saw last season. Ryan Mathews should be a first round draft choice (for good reason), and Rivers will more than likely finish as a low-end starter. But, since you’re trying to win your fantasy league, low-end starters aren’t favorable. That’s why you should avoid Rivers – a player being overvalued due to his name.